The article about Beyonce in the January 2009 issue of Elle is informative, enlightening and down right entertaining. Read a clip of it below and click this link to be taken to more of an excerpt on the Elle website. 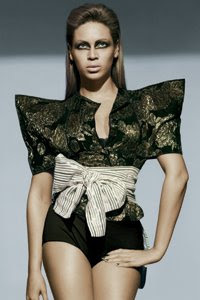 "................but she did on one occasion indulge her inner adolescent diva, which led to what is now known as “the slap.” Beyoncé, then 15 or 16, was making a promotional appearance at a Houston record store. As Tina tried to talk to her, Beyoncé started singing right in her mother’s face, movin’ and groovin’ and letting that voice of hers rip, so Tina, who had never spanked her girls, hauled off and slapped her daughter flush on the cheek. Thwack! The slap reverberated." In order to read the entire article, you must purchase the Elle. Article excerpt courtesy of Elle magazine.